Also known as Gosha, G.R., Georgiy Volodymyrov, Roman Shendi and O.Sufi. A friend of the “Odessa University” since 2004, starting September 2005 – journalist and responsible secretary of the newspaper. Bachelor of Publishing and Editing (2008), master of Journalism (2010). 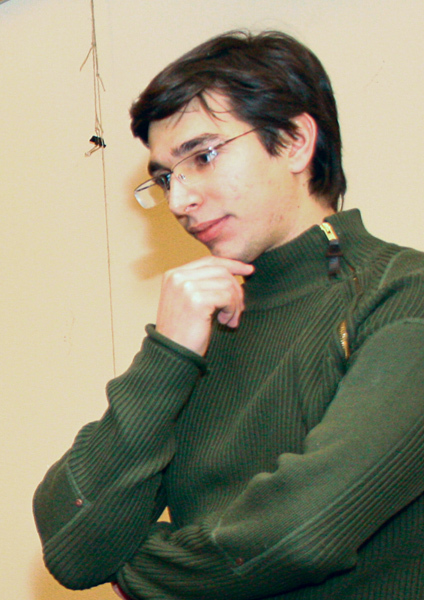 Georgiy received the scholarship of the Cabinet of Ministers of Ukraine (2008-2009). The press-service's leading specialist is the author of compilations of poems and prose “Sand clock” (2006), “Thin skin” (2008); co-author of five editions of the almanac “French Boulevard”. Georgiy Ryaboy was published in city, national and foreign press. He is interested in literature critics, philosophy, analytics of international processes. Now he is actively studying Internet Journalism. Georgiy enjoys finding a creative approach to the set challenges. Be as attentive in the end, as you were at the beginning, and you will achieve what is aimed for. Lao-Zi. Bachelor of Journalism (2010), master of Journalim (2011), winner of the American National Competition “Skills USA” in “TV news anchoring”. After an internship she was unable to separate with OU. A blonde at heart, who always achieves success if the aim and especially the terms are specified. Loves fast driving, sunrises at the sea and interesting tasks.